This is another quick reads book I picked up at my library. I have really started to get into these and I recommend everyone else doing the same especially if you want something you can get through in your lunch hour, you never know what you might find. This is a charming little novella about two people who are not happy with the way their lives have turned out. Craig – a police officer has recently been acquitted of police brutality. He has always been an officer who follows the letter of the law, however after the recent investigation he is questioning whether he is in the right job. He goes to Everdene to escape the stress as he likes surfing and there is a certain amount of envy for those who live that sort of life – care free and no responsibilities. Jenna- a local girl to Tawcombe, is from and drunken abuses home, she left to make a better life for herself. She now lives in a run down flat house share with 6 others and a bully for a landlord. Haunted by the memories of home she refuses to go back. When Jenna loses her job at the Ice cream shop, she barely has enough to survive, she definitely doesn’t have enough to pay rent which is already late…..So she takes matters into her own hands. 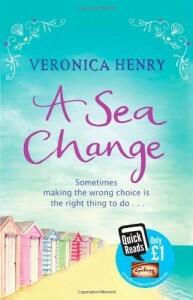 This is not only a portrayal of what is happening up and down the UK in seaside towns due to the recession, but it is also a story of hope and lives can change… even from making the wrong decisions. I really recommend this title as it is a “Quick Read” and easy going, really enjoyed it.